of photograph ) in advance of a major rainfall event. 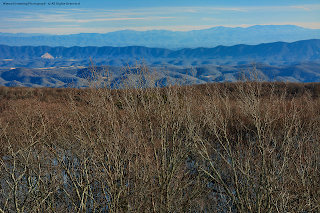 Using a long telephoto lens a ski slope on top of Beech Mountain in western North Carolina was visible, along with the stoic profile of adjacent Grandfather Mountain. 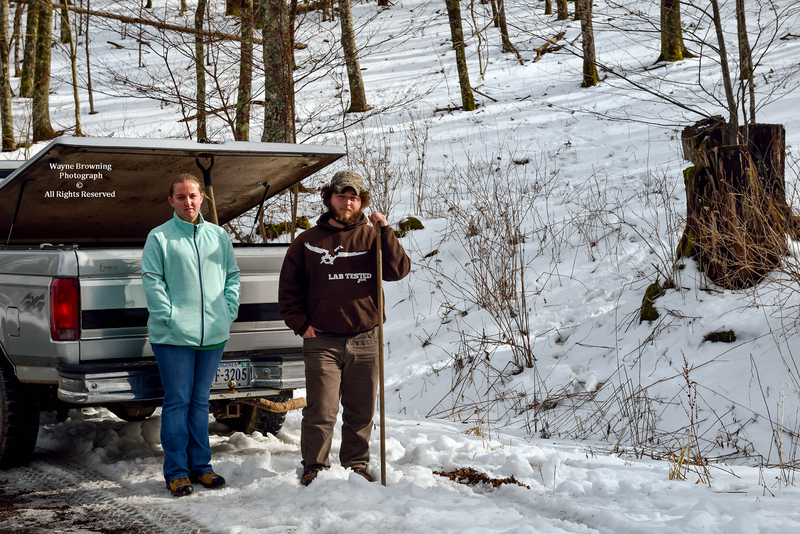 A field trip as part of the undergraduate research program at the University Of Virginia's College At Wise set out to see how much snow remained in the high country of the massif in advance of a major precipitation event. Extensive snow cover was visible from Bowman Mountain, which wraps around the head of Clear Creek Basin, southwest across the peaks of High Knob, Eagle Knob, and Little Mountain Knob to Big Cherry Lake Dam ( miles SW of the main peak ). 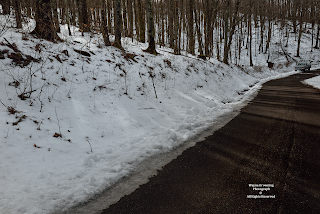 6-12" drifts from High Knob to Big Cherry Dam. as illustrated by the occasional 6-12" drifts observed. A clean snow core found a concentrated amount of moisture that equaled to 0.40" of water content per 1" of snow depth ( a density of 2.5:1 ). This translated to a general 1.00" to 2.00" of water locked up in the snow when not counting the larger snow drifts. While 1.00" to 2.00" of water content would not typically be that big of deal, around 3.00" of total precipitation had already fallen in the high country during the first week of February. This pushed whitewater creeks draining the massif above flood stage, with initial snow melt. ( with local drifts ). visible in the above photograph. Total precipitation at Big Cherry Lake Dam during the January 1 to February 9 period totaled 8.08" on the NWS rain gauge; however, this was somewhat low due to wind induced undercatches as air blows across the Dam ( with substantial losses during periods of frozen precipitation ). 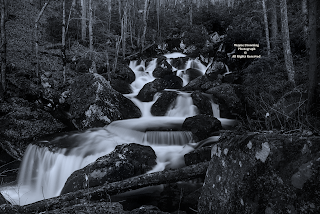 It was so dark by the time we reached this location that no color was visible, so I shot the photograph in black-and-white using a long time exposure. South Fork of Powell goes subterranean in places so when it is flowing completely above ground that is not a good sign in front of a major rainfall event, since that indicates underground conduits are full of water and will not be able to handle extra input. Big Stony Creek IFLOWS: 4.14"
Appalachia Lake Water Plant: 5.29"
*Big Cherry Dam IFLOWS: 5.87"
Big Stone Gap Water Plant: 5.97"
Big Cherry Dam NWS Gauge: 6.60"
*Updated for final storm totals. The worst flooding developed downstream from creeks that originated in the snow covered High Knob Massif, so collection of snow core data prior to this event proved important as it allowed for better resolution of how much moisture input actually contributed to flooding. ( the Dam at Big Cherry Lake helping, of course, to reduce total run-off ). The South Fork drains 40 square miles. Some of the worst flooding developed from the Ka-Fort Blackmore area downstream as huge volume from the 41.9 square mile Big Stony Creek basin was added to this area. Using just automated rain gauge data for a preliminary look, the effective input from snow covered basin heads where Big Stony Creek, South Fork of Powell and Clear Creek forms was on the order of 7.00" to 8.00" of water ( rainfall + around 1.50" from snow melt ). 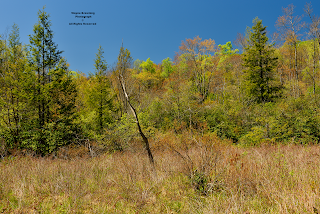 It is amazing ( incredible really ) that flooding was not more severe, and without question this was due to a huge amount of water input originating within basins possessing heavily forested, intact watersheds within the High Knob Massif. Veteran water plant technician Adam Herron captured this tremendous flow of water, which threatened to overtake the Big Stone Gap Water Plant, as it gushed downward through South Fork Gorge at around 9 AM on February 11.
in 4 miles downstream of Big Cherry Dam. It is an American Whitewater Rated Class V+ steep creek. 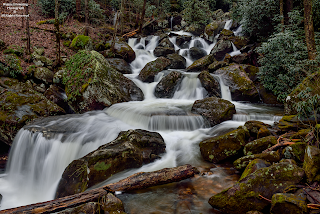 No one can understand the sheer power of these creeks unless being near them. It is simply INCREDIBLE! Adam's video is of this same view ( as well as my previous black-and-white pre-storm photograph ), but near peak flow volume during the flood. ( more rain fell during February 14 before I measured the NWS gauge ). Big Cherry Dam was closed to discharge during the flood, of course, and remained closed throughout February 14 with flow seen in these photographs being driven by spillway overflow and run-off. 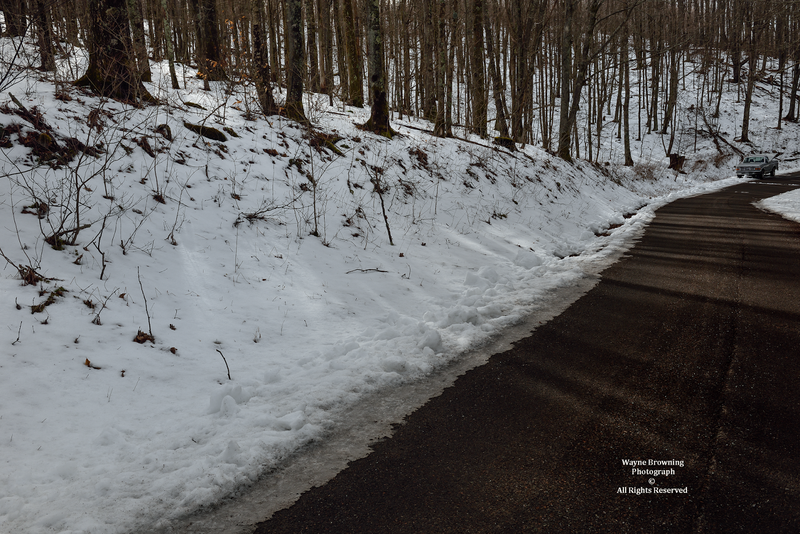 approximately 10.17" through February 14.
in northern Wise County and Dickenson County. SW upslope flow corridor ). 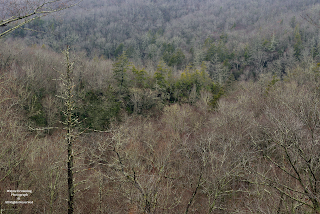 Just after I took the photograph below a bank of dense fog rolled upward through South Fork Gorge, which was below the low cloud deck due to sinking air into the Gorge during part of February 14.
witnessed & endured ( suffered by many ). for getting us thinking along these lines! 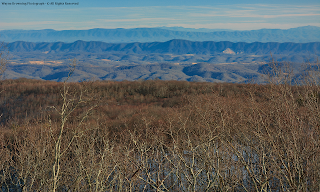 of the larger Upper Tennessee Basin. *I can determine the value specifically using ArcGIS, but just for these approximate calculations a rough-and-dirty use of Google Earth will be sufficient ( above ). Since Norris Lake essentially captures all the water flowing out of the Clinch-Powell river basin, this is the perfect setting to generate some realistic numbers ( at least, to stimulate thinking ). First, this will not be as neat as I would do on a UVA-Wise whiteboard, so bear with me and understand these are just the rough numbers. This is really quite simple, but might seem a bit complex at first ( the most important aspect, and reason for this illustration, being the SIZE of numbers that will be generated by just a quick inspection of this event in addition to its most important stimulation of thought ). Andrew did a quick check while we were talking and the inflow to Norris Lake was 72,410 cfs ( cubic feet per second ) during the PM of February 12.
at the current inflow of 72,410 cfs. So roughly 47 Billion gallons of water entering Norris Lake per day at that particular inflow of 72,410 cfs. Merely a moment in time. to the real core of this particular event. Round to 10 vertical feet of lake level rise. There are 325,853.4 gallons in an acre foot. 1.7 Million acres upstream of Norris Lake. 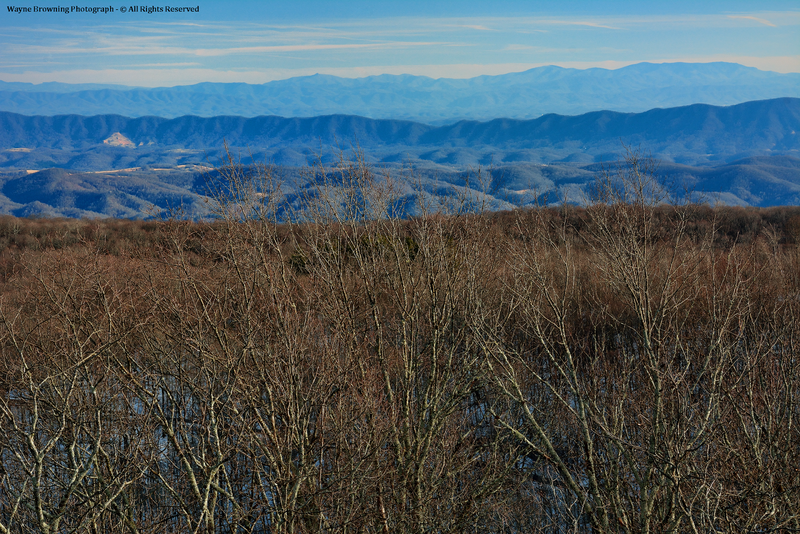 from the Clinch-Powell River Basin. If only 2.35" ran off, on average, why did it flood? 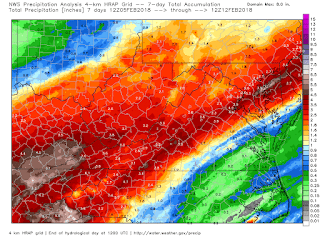 Even though local estimates are too low, please observe that the regions of heaviest rainfall across the southern Appalachians are clearly those which received upsloping on SW air flow. The High Knob Landform corridor and locations in southwestern North Carolina ( in this type of flow ). 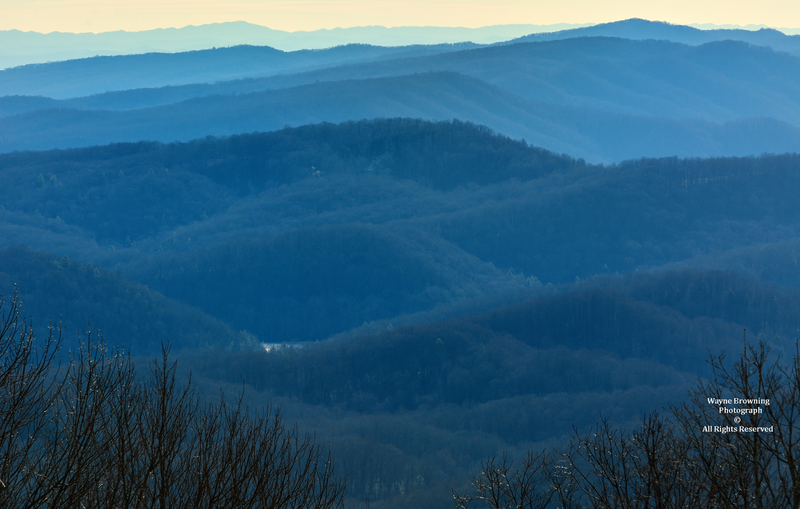 in favored regions of the Appalachians!!!! In reality, more fell on average than calculations generated and certainly more also fell locally than the NWS Analysis ( above ) estimated ( due to a lack of input data from favored orographic forcing locations within far southwest Virginia especially ). There are numerous reasons for this. Not all water that falls runs off to reach the main lake, some goes subterranean, some evaporates, some is retained within wetlands and other water bodies and does not flow to the main water body, and during the growing season ( especially ) much undergoes uptake by trees and vegetation. High Knob Landform corridor versus the remainder of the Clinch-Powell Basin. the minority of the total 2656 square miles. What makes this more significant than in most cases is the fact ( as my climatology documents ) that average annual precipitation decreases UP-BASIN across the Clinch-Powell beyond the massif of High Knob instead of increasing as is more typical of most river basins. above mean sea level ). Case in point, during the February 10-12 period a total of 1.60" of rain was officially measured near the head of the Clinch River in Burkes Garden versus 6.85" at approximately the same elevation in the High Chaparral-Robinson Knob communities of the High Knob Massif ( from a IFLOWS that has a well documented history of reading lower than hand-measured gauges ). At least a 5.25" difference ( decreasing up-basin ). If it were not for years of very well documented conditions this might be written off as merely an anomaly associated with this particular weather system; however, it is actually a persistent and strong factor in the long-term climatology of southwestern Virginia. below for more details on this type of flow. 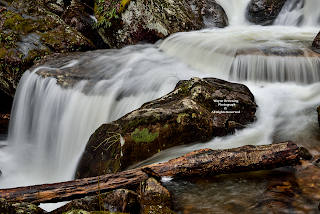 there is more to annual wetness than mere elevation! 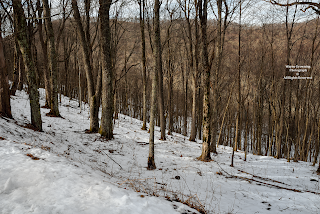 Finally, snow melt contribution can not be neglected as it added more water than modeling predicted, especially for locations downstream of the High Knob Massif where river level forecasts had to be adjusted UPWARD the most during the course of this event. 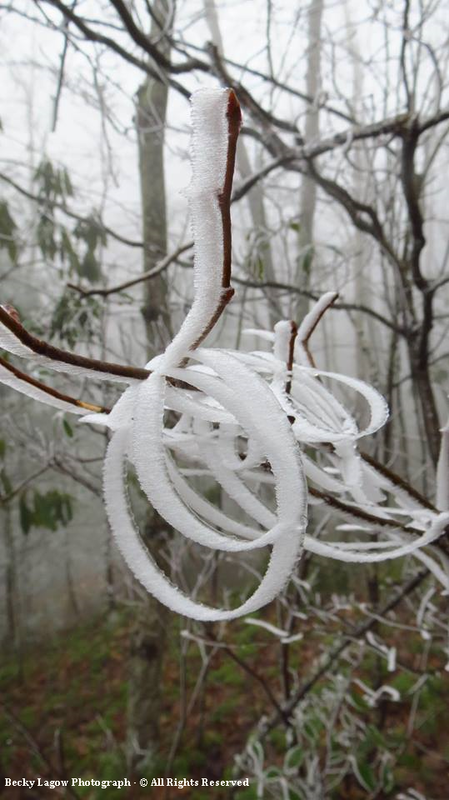 I have seen rime for decades, and some crazy stuff, but I have to sure thank my friend Becky Lagow for finding probably the most unique rime formations I have ever seen in the high country. 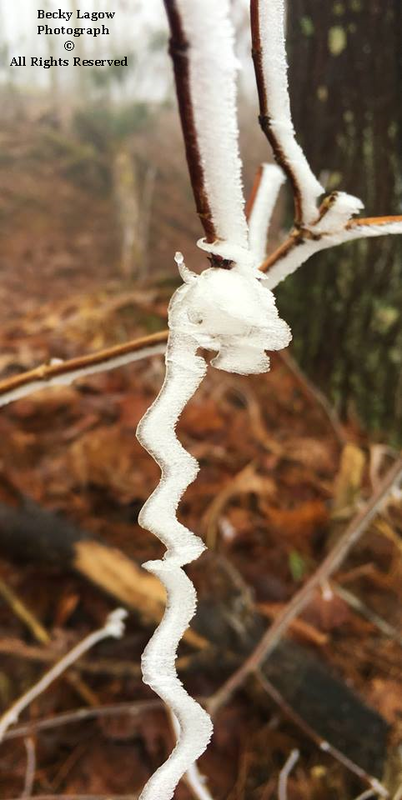 This rime displays the characteristic INTO the wind growth pattern, and a layering seen so often with deposition over time, but otherwise has developed an epic form. Deposition with transformation from supercooled cloud vapor to solid rime is an exothermic process that releases 680 calories of energy per gram of water into the air ( the combined energy from condensation + freezing ). 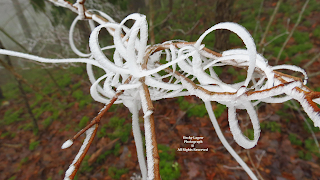 Well it might appear that the rime has merely formed on a vine, but in fact NOT! There is no vine present! The explanation is NOT for certain, but I feel it is definitely related to turbulent air flow and abundant low-level moisture present in wake of flooding rainfall that was subjected to a rapid temperature drop into early Monday amid orographic clouds. 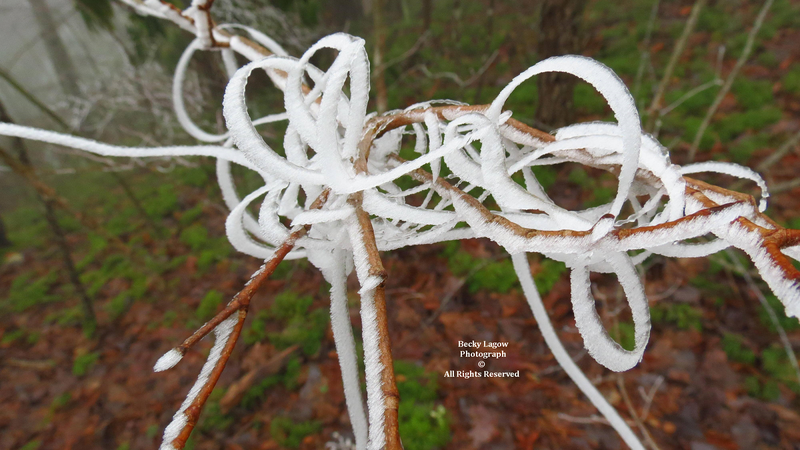 A temperature gradient generated by a difference between water in the lake, that was warmed by heavy rain ( versus recent ice coverage ), and air surrounding the lake may have played a role in creating the swirling air motions necessary to generate this awesome rime. Much like the current pattern, the main anomaly during February 2003 featured a SW upper air flow pattern across the eastern USA with a notable gradient between High Pressure in the western Atlantic and a cold trough over the central USA. 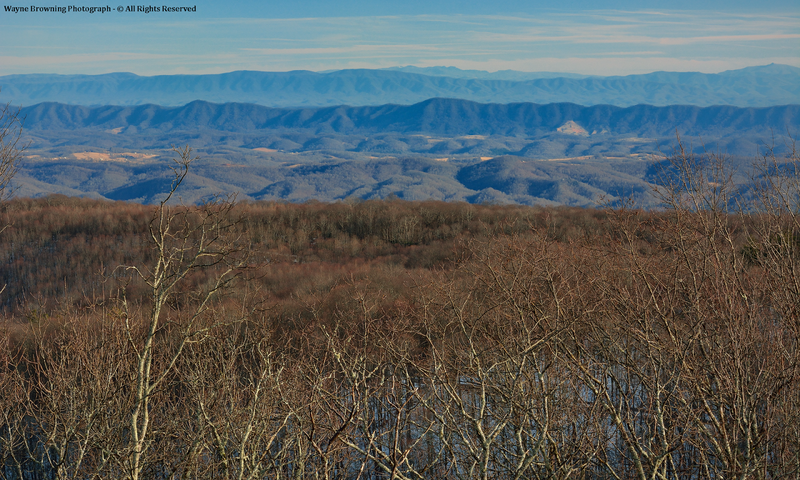 The all-time wettest February on local record, as well as for the state of Virginia, occurred during 2003 when the Big Stone Gap WWTP established a new all-time mark for wetness in the Old Dominion during February with 11.81" of total precipitation. the February 13-23 period in 2003. ( deeper than in 2013 ). typically falls during an entire February! Powell Valley, with 6.30" that barely topped the 6.28"
measured at the Big Stone Gap WWTP. 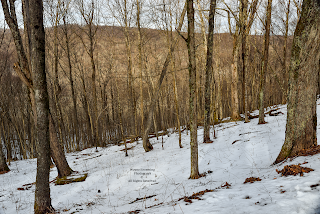 Flooding from the City of Norton into river valleys of the Clinch and Powell would have been more severe had all the snow melted off the high country surrounding High Knob, above 3500 feet, where I measured north slope depths of 7" to 12" . 3000 feet during the Winter Season of 2002-03 . Second major storm hammers mountains! The second major league storm system within less than a week hammered the area, with at least 100 roads being blocked by high water, mud, and rock slides by early afternoon of February 22 in southwest Virginia. A near major disaster was prevented only by a prolonged break in rainfall amid the windy, warm sector of the system which itself generated a line of severe thunderstorms packing high winds and pea to quarter size hail. Incredibly, a 1 to 3 inch blanket of snow fell upon the battered landscape a few hours after severe thunderstorms. 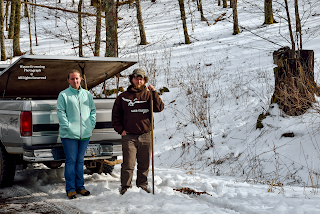 Unofficial totals were locally greater, of course, with Jennifer & Tracy Garrison measuring 11.96"
of total precipitation in the Cracker Neck of Powell Valley. 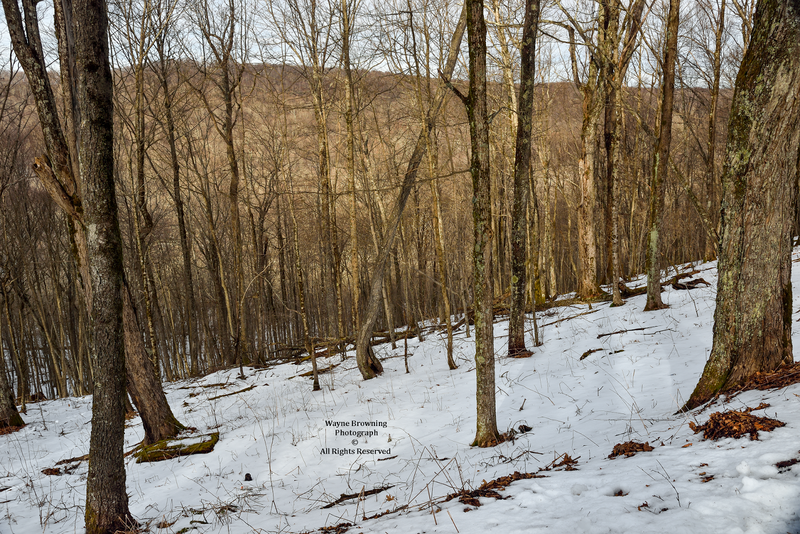 Totals over 12.00" occurred within upper elevations of the High Knob Massif. reported by Mrs. Colleen Cox was 7.74" in Burkes Garden. *Just adjacent to the basin head.